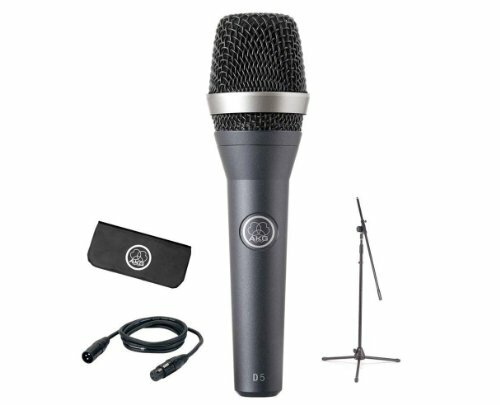 The AKG D5 Stage Pack is a mic stage kit that includes a D5 dynamic vocal microphone with a carry bag, a 16' XLR cable, a microphone stand and an H61 mic stand adapter. The D5 professional dynamic vocal microphone for lead and backing vocals delivers a powerful sound even on the noisiest stage. Its frequency-independent super cardioids polar pattern ensures maximum gain before feedback. The D5 stands for a crisp sound that cuts through every mix. The dual shock mount eliminates any kind of mechanical noise for trouble-free live use. The audience will hear the pristine sound of your voice!